Major props to Kaspars Dambis and the original tutorial that he wrote. I do things a bit differently, but that tutorial was absolutely instrumental in getting me up and running. 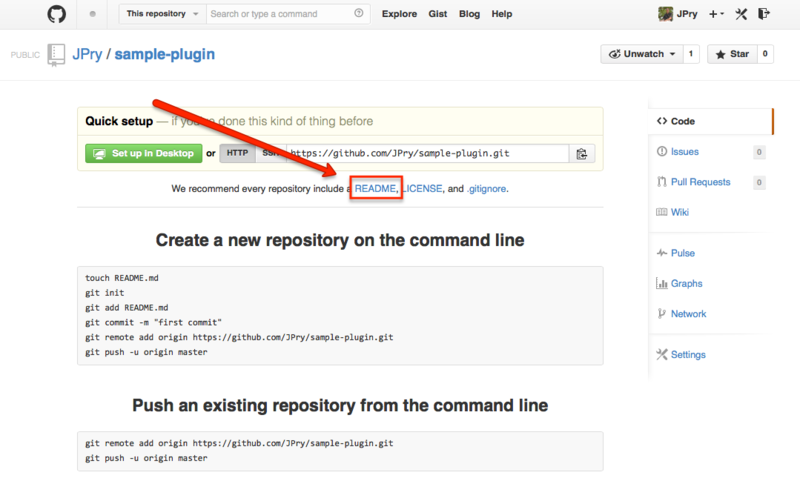 Note: This tutorial assumes that you’re setting up a new Plugin in the WordPress.org repository, and that you are starting with a GitHub repository. 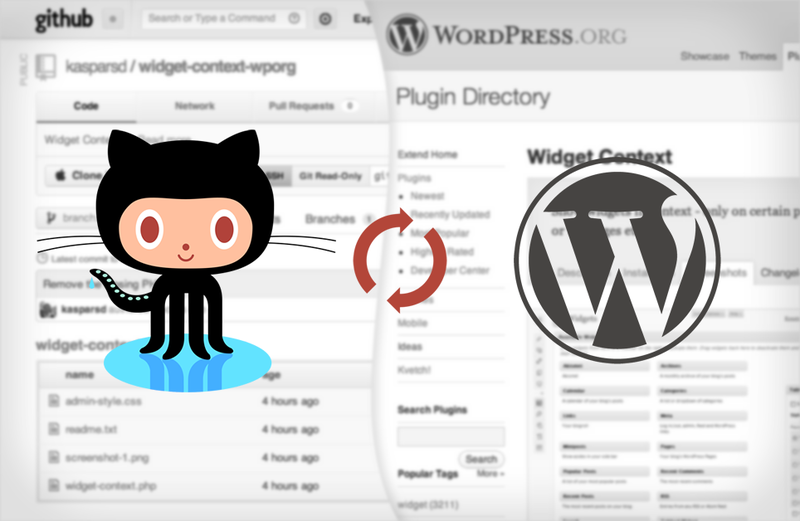 If you have an existing Plugin in the WordPress.org repository and merely want to switch to managing it with Git/GitHub, then please see this awesome tutorial instead. For this reason (and the fact that I prefer working with Git), I like to start my Plugin development on GitHub. However, this leads to a few extra steps in getting the Plugin set up on the WordPress.org repository. The purpose of this turorial is to document these steps as much for myself as for anyone else who wants to do something similar. If you already have a local Git Repository to push, skip to the “Existing Repository” section. 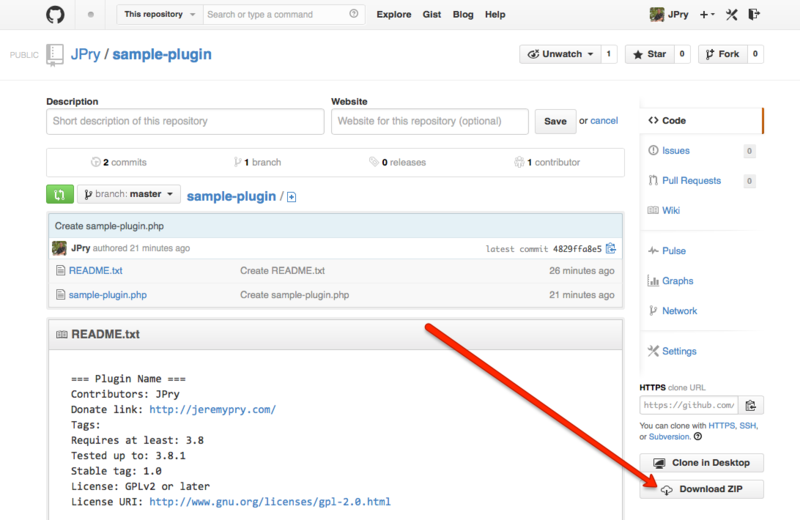 Click the “New File” link to create the main file of your plugin. It is good practice to give it the same name as the overall repository name (e.g. sample-plugin/sample-plugin.php). Push your code up to GitHub (this is assuming you’re working with the branch “master”). Fill out the Add Your Plugin form on WordPress.org. Since you already have a README.txt file, this should be a matter of copy and paste. For the “Plugin URL” field of the form, use the link that you just copied from GitHub. Note: I’m not sure if this step is necessary. Delete your local repository. We’ll set it up again later. Seriously, just be patient. It could take a long time (a week or more) before the Plugin Review team is able to review and accept your plugin. It all depends on how many other plugins need to be reviewed ahead of you. WARNING: --prefix is not given, defaulting to empty prefix. the SVN-tracking refs to be placed at refs/remotes/origin/*. NOTE: In Git v2.0, the default prefix will change from empty to 'origin/'. The --no-minimize-url flag is important, as it stops git svn clone from moving into the base folder of the remote SVN repository and going through all plugins (see git-svn docs). We also use the -s flag which is a shorthand way of setting trunk, tags, branches as the relative paths, which is the Subversion default (from git-svn docs). In regards to the big WARNING message, it looks like it would be a good idea to include the --prefix flag in the future. I would probably recommend doing something like --prefix=svn/, so that we can still use the origin remote for GitHub later. Add the GitHub repository as a remote. Here, you can see that I’m using the branch information from the previous section. The --onto remotes/trunk flag is telling Git that I’m using the SVN trunk “branch” as the base, or beginning, of my history. The --root remotes/origin/master section is specifying the exact branch we want to rebase. This is the history from GitHub. What are we looking at? Well, basically you can see that trunk (our SVN “branch”) and master are still back at the commit with ID 368bc04 (the last one in the output above). We need to bring those up-to-date. The -f flag is necessary to force the push to go through. The reason is because of the git rebase command that we used earlier. We have existing history on GitHub, and one of the side effects of rebasing is that all of the old history is removed, and replaced with new history. The forced push stops Git from complaining that the history no longer matches. You already made this Plugin, so you should be ready to release it to the world! I’m tagging with version 1.0, but feel free to use a different version if applicable. This takes a lot longer… again, I’m not sure why, but I’m assuming it has to do with the processing that needs to be done by the SVN server. Now let’s assume that we want to create a new release of the Plugin in order to invite the Plugin users to report bugs and get involved on GitHub. 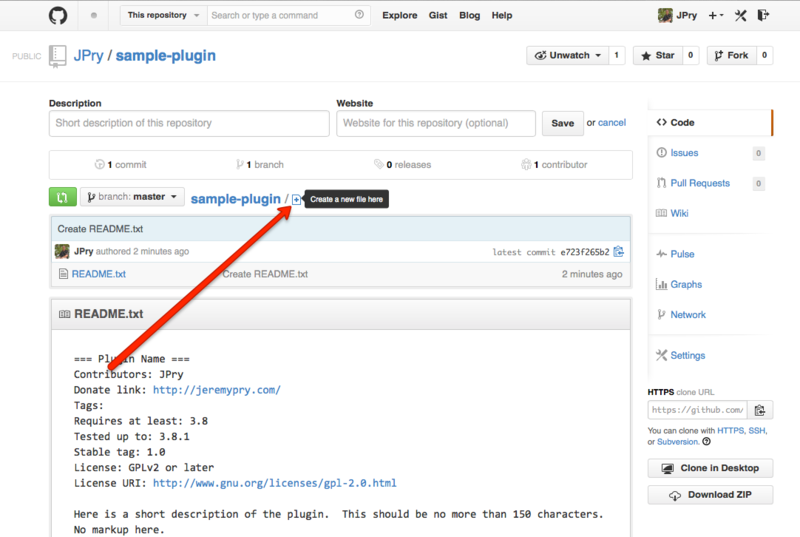 For that we need to edit the copy of readme.txt and bump the version number of the plugin. Once you have switched to using Git as your version control system, you should always use git svn dcommit to publish changes to the SVN repository. Otherwise, you must run git svn rebase every time before pushing changes to SVN in order to merge changes from the SVN repository into your local Git repo. This will create /tags/1.0.1 in the remote SVN repository and copy all the files from the remote /trunk into that tag, so be sure to push all the latest code to /trunk before creating an SVN tag. Let’s track that folder as a seperate Git branch called assets. Every time you need to update the cover image or screenshots you, simply checkout that branch, do the changes and publish it to SVN using the same old git svn dcommit.